WASHINGTON (Reuters) - The United States aims to cut Iran's crude exports by about 20 percent to below 1 million barrels per day (bpd) from May by requiring importing countries to reduce purchases to avoid U.S. sanctions, two sources familiar with the matter told Reuters. 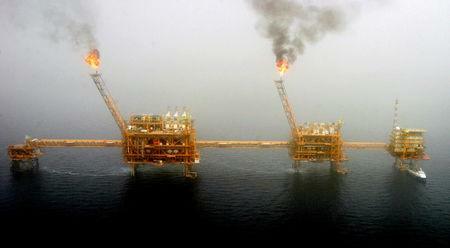 U.S. President Donald Trump eventually aims to halt Iranian oil exports and thereby choke off Tehran's main source of revenue. Washington is pressuring Iran to curtail its nuclear programme and stop backing militant proxies across the Middle East. To give time to importers to find alternatives and prevent a jump in oil prices, the U.S. granted Iran's main oil buyers waivers to sanctions on the condition they buy less in the future. The waivers are due for renewal every six months. "India, China and Turkey – the three tough cases – will continue to negotiate with the administration and are likely to keep their waivers," one of the sources said. The administration would likely struggle to cut Iran's exports much below 1 million bpd due mainly to strong demand from China, India and Turkey, said Amos Hochstein, who was in charge of Iran sanctions as the top U.S. energy diplomat under former President Barack Obama.